For many years William Thomas was a complete mystery. He is not in the 1911 Ranmore census, nor apparently was there a family called Thomas connected with the Denbies Estate. There is a William Thomas born Dunsfold, Surrey in about 1887, a groom in the 1911 census and a milk boy on a farm in the 1901: with these occupations he could later have worked at Denbies. He could have been the William Thomas, workman, who married Agnes Kate Tayman at Chiddingfold in December 1915. However, he does not feature among the principal lists of the war dead, and there is no other positive clue to his being the correct William. 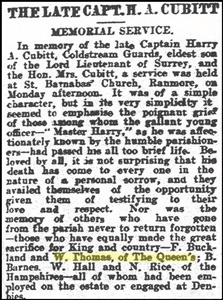 Then, quite recently, a reference to “our” William Thomas was discovered in the Surrey Mirror and County Post report of the memorial service at St Barnabas for Henry Archibald Cubitt, eldest of the Cubitt sons and the first to die. From this newspaper cutting William’s regiment was discovered – The Queen’s (Royal West Surrey Regiment) – and also that he died before 25th September, 1916, the date of the memorial service. The cutting also confirmed that William either worked on the Estate or at Denbies House itself. Below are details of these three men, as far as is known. If anyone can help with any further information on any of them, or has any further suggestions of another possible candidate, do please contact us. William Frederick was born on 31st January 1896 in Ashburton Grove, Holloway, and baptised on 28th March at St Barnabas, Holloway. He was the son of Daniel George Thomas, a railway porter/foreman, born about 1861 in Hertford, and of his wife Hannah Elizabeth, born around 1859 in Maidstone, Kent. In the 1911 census William was living with his parents and three older siblings, and working as a plumber’s labourer. There is no obvious link with Denbies, but he could later have moved there to work on the Estate in some capacity. On 14th August, 1914, ten days after the commencement of WW1, William Frederick Thomas aged 19 enlisted at Guildford in the recently formed 6th Battalion of The Queen’s, service number G/131. The following May he went to France, landing at Boulogne on lst June. He was promoted to Lance-corporal. Then, on 17th October 1915 he was killed in action and buried at Philosophe British Cemetery, Mazingarbe (between Bethune and Lens), grave reference IV J 2. His mother was presumably dead, but the inscription on his gravestone from his family reads: “With ever loving memory from Father and Sister”. William Frederick was awarded the 1914-15 Star as well as the British War and Victory Medals. William Joseph is the second candidate, but, apart from being in a Surrey regiment and recalled from the Reserve in August 1914 at Guildford, in everything else he seems to be Welsh. He was born about 1880 in Aberdare, Glamorganshire and married Margaret Jane Williams at Pontypridd in 1904. In the 1911 census he was a coal miner in the Rhondda, Wales, living at Porth with his wife and two small sons. His service number is Private L/5812 of the lst Battalion of The Queen’s, which means he was a regular, and would originally have enlisted in early 1899, most likely for a basic 7 years with the Colours (1899-1906) and a further 7 years with the Reserve (1907-1912). 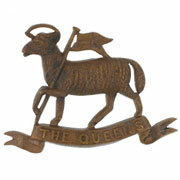 His service commitment would have expired by August 1914, so he had probably extended his service at some stage. His name is not obvious in the 1901 census, so perhaps he was in South Africa for the Boer War. With his Welsh and coal-mining connections, it seems therefore unlikely that he was involved with the Denbies Estate between the census in 1911 and the outbreak of WW1 in 1914. Recalled from the Reserve, he transhipped to France on 13th August, 1914, landing at Le Havre, and was killed on the 31st October (presumably at the Battle of Gheluvelt, where there was great loss of life). William Joseph Thomas has no known grave, but his name is remembered on the Menin Gate at Ypres, Panel 11-13 and 14. This is the third candidate, although, unlike the other two, some of his service papers, mostly before WW1, did survive the WW2 bombings. William Edward Thomas was born in East London around 1884, the son of another William Thomas, brass finisher, and his wife Jane. In January 1903 aged 18 and 10 months, occupation carpenter’s labourer, William Edward Thomas enlisted in The Queen’s at Stratford, Essex (Private L/7739) , and later served in Syria and South Africa in the lst Battalion. He was promoted to Lance-Corporal, but the appointment was rescinded a few months later for “neglect of duty when in charge of a tent”. Despite this and a couple of other misdemeanours, his conduct when leaving the Colours in 1905 for the Reserve was described as “very good”. In the 1911 census William Edward was visiting the Cable Street household of Mrs Sarah Fox whose daughter Eliza Fox was a tailoress. William was a chair -maker (or ? chair-shaper), and on Christmas Day that year he and Eliza married at St Paul’s Shadwell. Subsequently a daughter was born. It seems, therefore, unlikely that he worked at Denbies in the few years between 1911 and the outbreak of WW1: on 7th August 1914, he was recalled from the Reserve and on the 26th embarked for France on the “Braemar Castle”. He was reported missing (“unofficially reported dead”) on the same day (31st October) as William Joseph Thomas (above) died, presumably in the same Battle of Gheluvelt. However, in February 1922 William Edward’s identity disc was returned to his widow. The Commonwealth War Graves Commission gives his place of burial or commemoration as Hooge Crater Cemetery, Belgium, reference XXI.G.10. 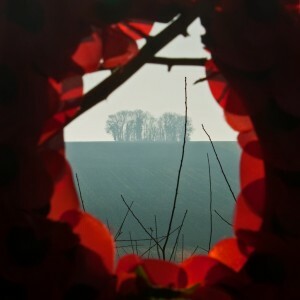 Of the 5,916 Commonwealth servicemen buried or commemorated in this cemetery, 3,570 of the burials are unidentified. William Edward Thomas was posthumously awarded the 1914 Star with clasp, as well as the British War and Victory medals. 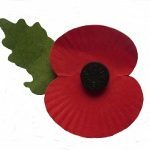 The clasp was popularly known as the “Mons Star” because of the Battle of Mons and subsequent retreat; it denoted an individual who had been under fire between 5th August and 22nd November 1914. William Edward’s widow Eliza Thomas was awarded a pension for herself and their daughter. Later she remarried, becoming Mrs E. Corkery of 23a Juniper Street, Shadwell, East London. Many of the sources mentioned are available online via Ancestry, Find My Past and Free BMD.